Be part of the adventure of hiking and abseiling the Rocher de Sion and enjoy the view at the top before rappelling down the cliff. 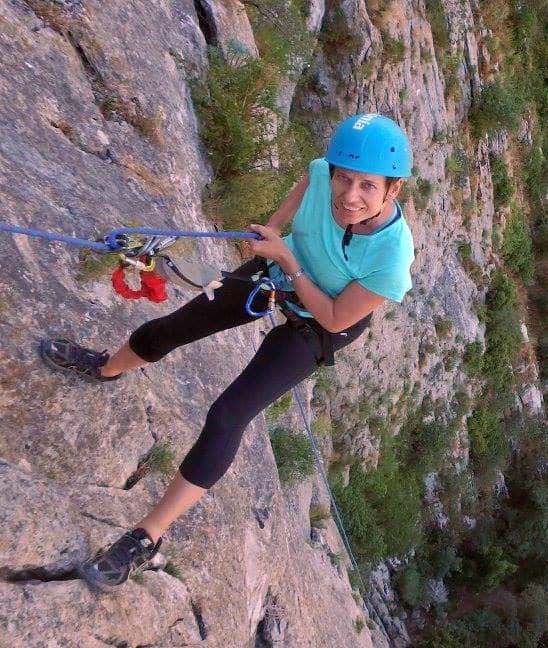 This activity is located in Agonès in front of the village of Saint Bauzille de Putois and above the Hérault gorges. Anyone can do it above the age of 10. It is a route mixed with hiking, climbing, via ferrata and rappelling/abseiling. The smallest rappel is 20 metres high and the biggest one is 55 metres high. The ascent is done by following a cable attached to the cliff so that you are secured all the way up and above the river. At the top, you are welcomed by the gorgeous view on the Thaurac mountains. It is worth it! The activity lasts 4 hours. The meeting location is at 10:00 in front of the Mairie (town hall) in Agonès, 35 minutes from Montpellier and 10 minutes from Ganges. As soon as the group is complete, the gear is handed out and safety instructions are given to you by a certified instructor. We then walk to the start of the route for 20 minutes and it ends with a 20-minute hike. Each participant needs to bring a bottle of water, something to eat for lunch and snacks, a pair of sneakers/trainers, sunglasses and sunscreen, a vest and a small backpack.